Last year, Tesla shared its ambitious plans to increase its annual production capacity to 500,000 vehicles in 2018 with new Model 3 production. It’s a higher planned production capacity than any other all-electric vehicle offered today. But Tesla also plans to repeat it with the upcoming ‘Model Y’ and now a new report suggests that both vehicles could virtually dominate the global EV market early in the next decade. Morgan Stanley’s research group released a new blue paper about electric vehicles last week. In the paper, they tracked the progression of EVs over the last few years and made projections about the future growth of the technology within the passenger car sector. For the next few years, we have a pretty good idea of the new electric vehicle models coming to market and the existing programs. 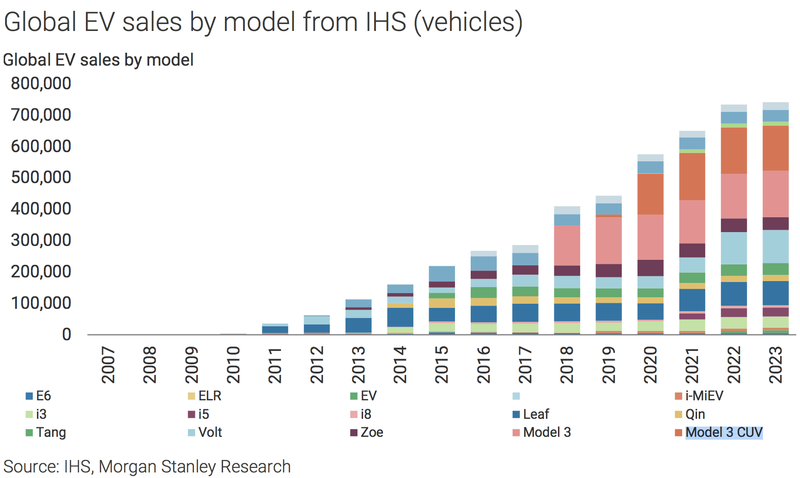 Using data from IHS, Morgan Stanley projected global EV sales by model and concluded that Tesla’s Model 3 and Model Y alone could represent roughly half of the market by 2020. The Model Y, which is not a definitive name, is being referred to as “Model 3 CUV” because it will be an all-electric compact utility vehicle built on the Model 3 platform. Earlier this year, Tesla CEO Elon Musk said that Model Y will be built on a new platform for production in “late 2019 to 2020”, but he changed his mind last month and confirmed that the new vehicle will be coming to market sooner using Model 3 architecture. Musk said that he sees demand for the small SUV to be even higher than Model 3. Last year, he said that he anticipates demand for the Model Y to land between 500,000 to 1 million units per year – versus around 500,000 units for M0del 3. It’s important to note that Morgan Stanley’s projections are significantly below Tesla’s own estimates. It’s not exactly surprising to see Tesla dominate those projections since the company is virtually alone in forecasting production for its electric vehicle programs. Most electric vehicle programs from other automakers are currently low-volume compliance cars and while some are promising more important volumes with new vehicles coming between 2019 and 2021, they rarely confirm production targets beyond vague projections like “25% of sales to have electric powertrains (BEV, PHEV, and BEV) in 2025” across their entire lineup. To be fair, automakers, like Nissan and Daimler, are actually preparing for higher volumes of electric vehicle production with factory conversions, but it’s still difficult to estimate the size of their vehicle programs. Tesla actually discloses its production targets and whether or not anyone thinks they can achieve them, they actually invest in the vehicle production capacity, with the Fremont factory, and the battery supply chain, with the Gigafactory, to support those projections of millions of units. Now the question is when will Tesla actually unveil the Model Y, or whatever the name of the crossover, and start taking pre-orders so we can get an idea of the demand. It would have to be relatively soon if they actually plan to start production in 2019 or sooner. What do you think? Let us know in the comment section below.